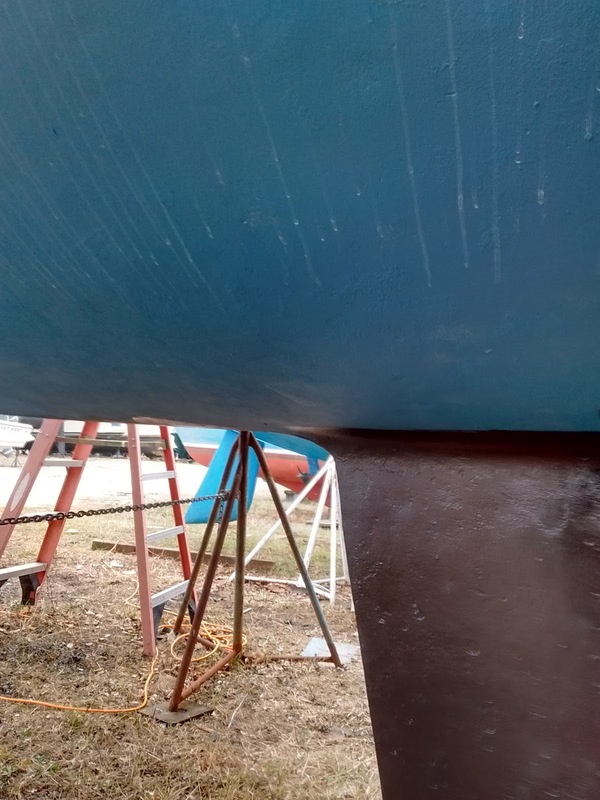 So here's a shot of the new test hull in its smooth and ever so stylish coat of black antifouling paint. 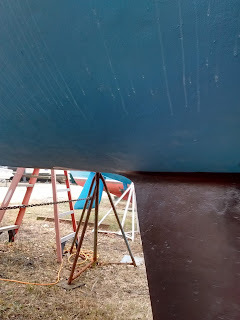 Beneath two coats of that lie two coats of BLUE antifouling paint, and then four coats of epoxy barrier coat because the guys who did the sodablast on this hull screwed it up, rather badly. 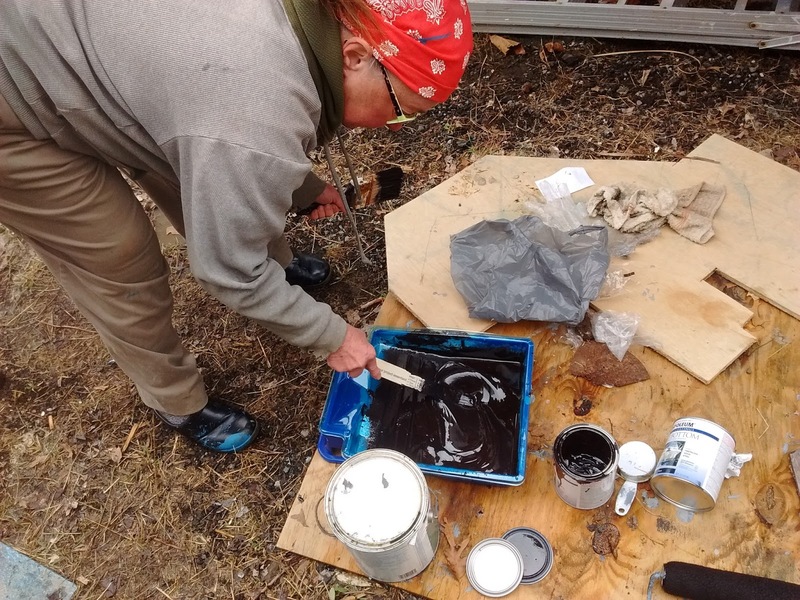 If you're wondering why black over blue, it lets us know when the bottom paint gets thin: when we begin to see blue under the black paint, it's time to pull and re-do the thing. Bottom paints contain materials toxic to marine organisms, usually copper compounds. When barnacles or worms try to attach or burrow, they encounter the copper and drop off. Some of the newer paints contain other anti-slime and algae chemistry as well. The paints come in two flavors: hard and ablative. The hard bottom paints are modified epoxy paints, and are typically used where the boat sits in the water without moving for long periods of time. They're quite durable, but if pulled out of the water, the surface will oxidize rapidly (usually within 72 hours) and become ineffective. Ablative paints are "self polishing", slowly sloughing off the surface of the paint to reveal more of the copper beneath, thus making them self-renewing.. They are used in situations where the boat may be pulled out of the water or trailered frequently. As "Tesla's Revenge" will not be taken out of the water for long periods of time, we chose a hard paint. The theory is: it's water cleanup. The fact is, it's damn hard to get off anything, including skin. We're excited; racing time and the weather to our splash date in two weeks. Stay tuned. Second half of our composting toilet build shortly, btw. More stuff over at Life, Art, Water. Sorry for the pause in posts. Our weather here turned briefly beastly, which made it difficult to do boat work. Stuff improves today and we'll be back with photos and new info in a day or so. 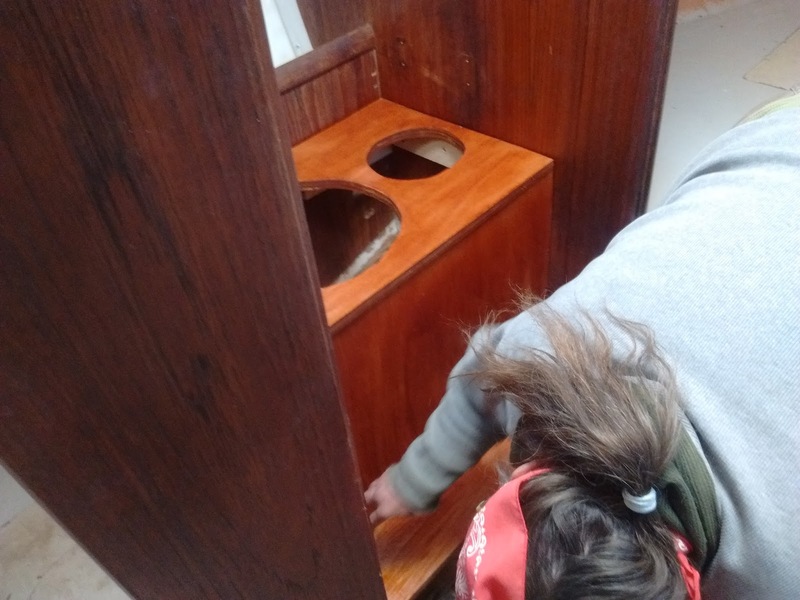 Since our new test hull had already had the head and the blackwater system (vile things, don't use em) removed, we felt it was incumbent on us to build in a new composting head drawing on our experiences of the last four years. First, of course, we had to build a platform on which it could sit. The Cal hull we're using is. . .well. . .curvy, including the floors. 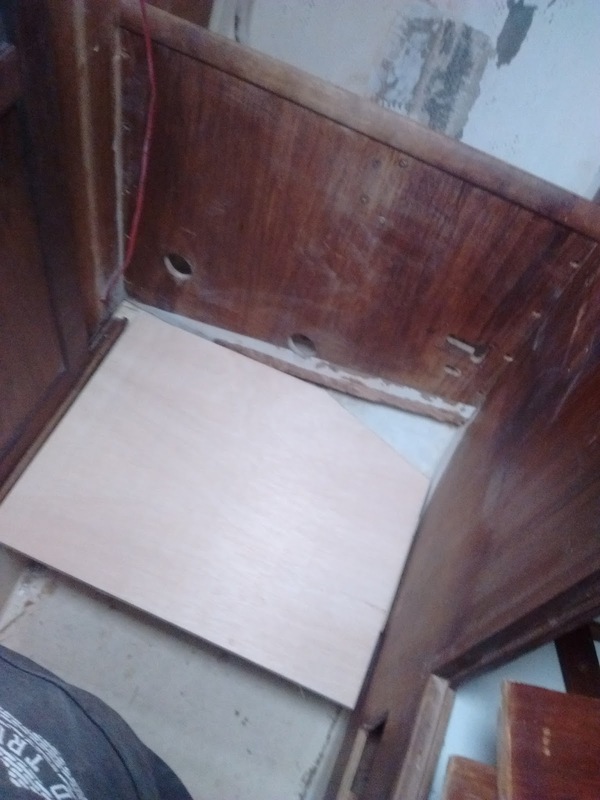 So we inserted a pice of 3/4 birch ply to serve as a base and stained and polyurethaned it. 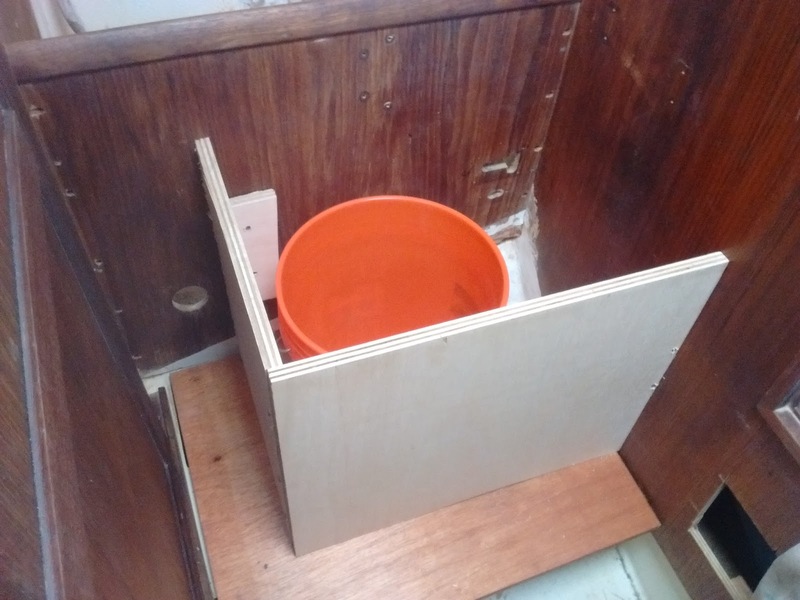 New platform for the composting toilet. 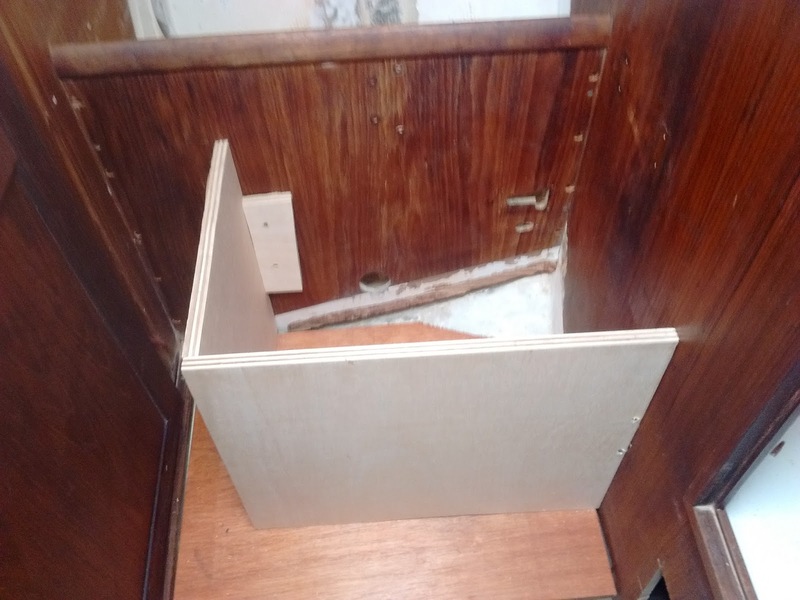 We then put in two sides to make the box that will hold the head. Here's where the bucket will sit. 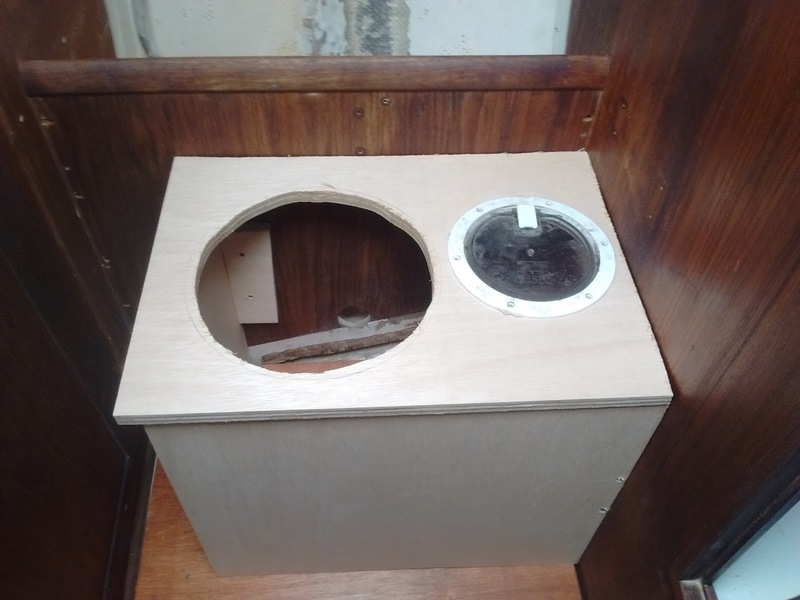 Then we added the lid, including an opening for the bucket top and snap on toilet seat and a deck access hatch beneath which will be our bin of sawdust or stove pellets. We put stops underneath to keep the lid from sliding. The little access hatches (intended mostly for kayaks) work perfectly here. 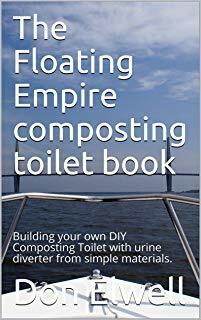 If you need one, duckworksmagazine.com has some great prices in their store, and is a wonderful source for boatbuilding ideas and materials. Recommend them highly. So then Gail got to stain the thing. So here's the basic box, awaiting additional stain and varnish and stuff. More shortly. We'll finish this thing tomorrow and I'll gie you a full report. We've been using this current cold snap (epoxy doesn't like the cold much) to put the interior of the boat back together. 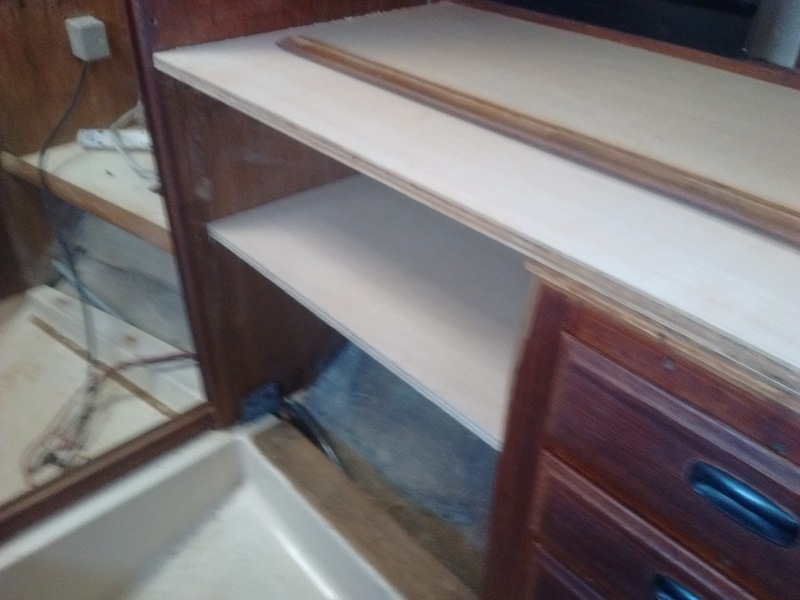 The inside of the old CAL 2-29 hull was all teak, but it had pretty much been disassembled by the previous owner who, mercifully, kept most of the parts. So for most of the last two days we've been re-installing the pieces we had and fabricating those we didn't. 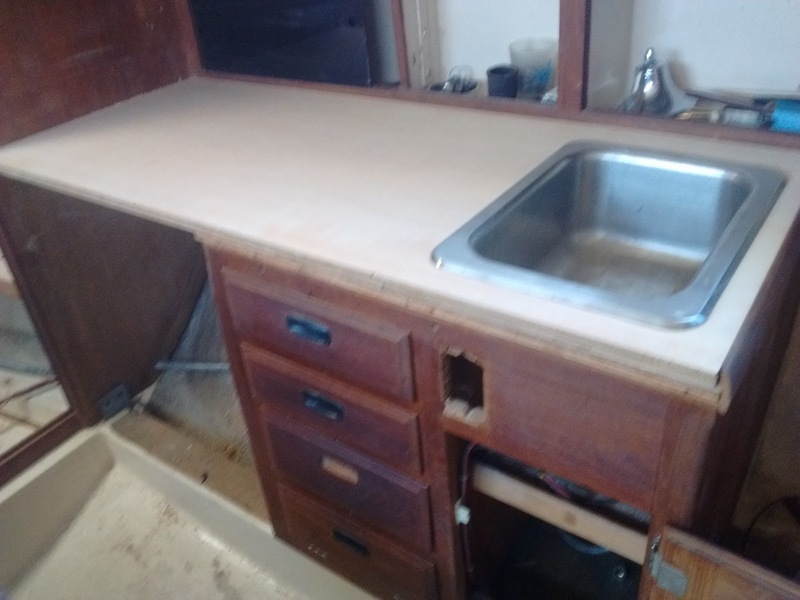 We made a nice, new countertop from some cabinet grade ply and got the sink re-installed. There had also been a well-type ice box built into the counter that had been ripped away. We used that space to put in some shelving for pots and pans. When you cook with cast iron, it needs a solid place to hide. Then there was the matter of the head. The old blackwater system had been removed, but I had to build a platform for the new composting head. All in all a pretty productive day. Now we'll oil the teak and make it pretty. If you'd like to help us with the poject, stop by our indiegogo page here and show us some love. 15 days left. 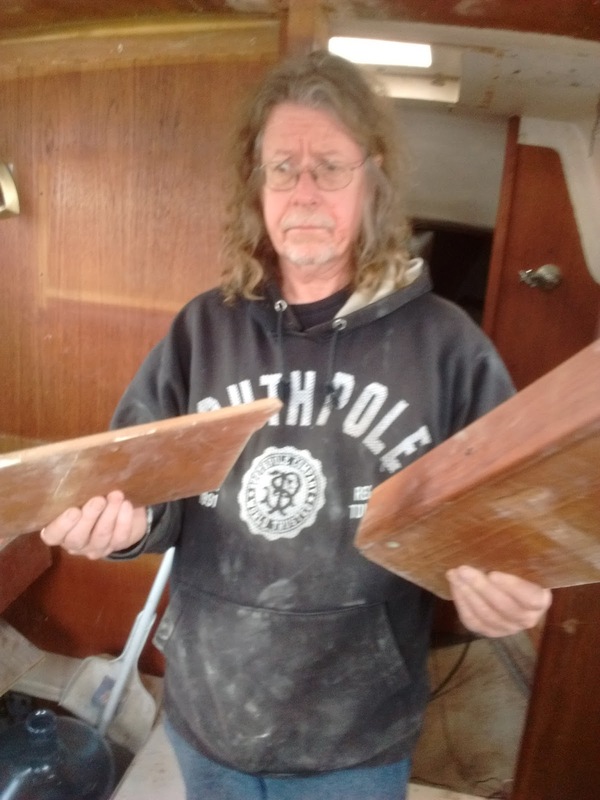 So we've spent the last two or so days in a howling wind aboard the new hull, putting things ready to get her into the water. All the teak trim pieces are on the boat, but unfortunately, they're all detached. It's like a giant jigsaw puzzle. 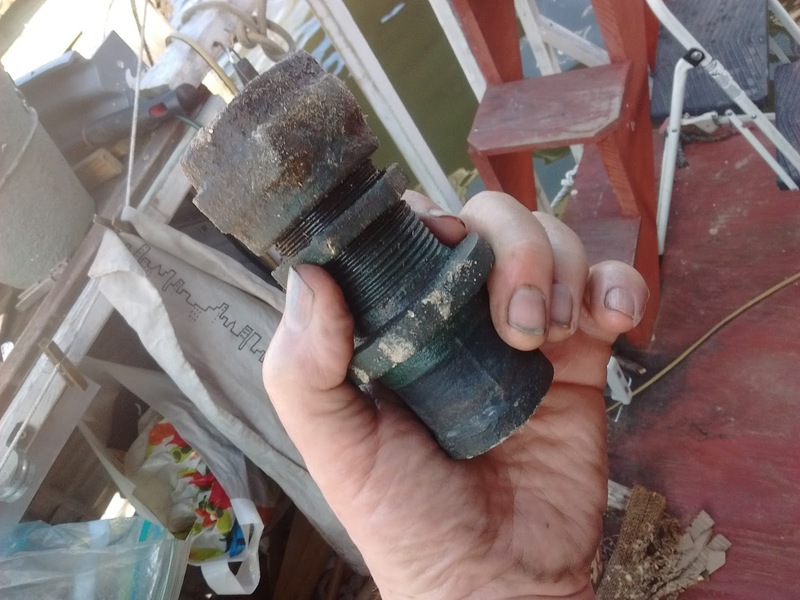 Then there's the matter of the packing box and the old propeller shaft, which is conveniently located UNDER the cockpit in a lovely space that entails a Downward Dog facing posture to access. 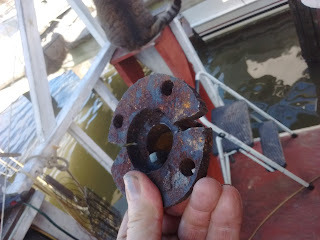 The coupler on the head of the propshaft was so rusted I had to cut it off with an angle grinder. . . . in that space. . . .about 4" from my face. That let me pull out the propshaft. So then we had to address the packing box itself, which was mercifully easier to deal with. It's ugly, but the wearing bits are in good shape, so we lucked out there. 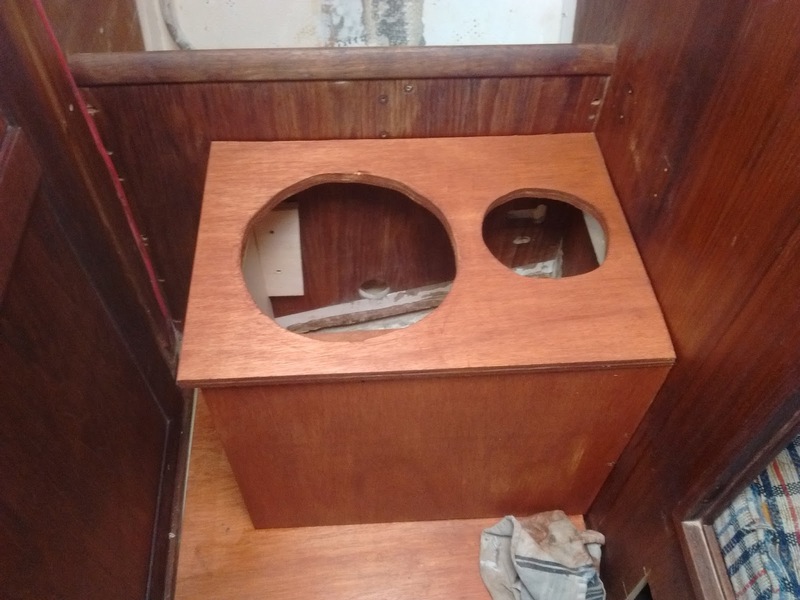 So, today, we'll get the rest of the teak back in place so I can address the wiring and maybe get the packing box back in place and sealed in. 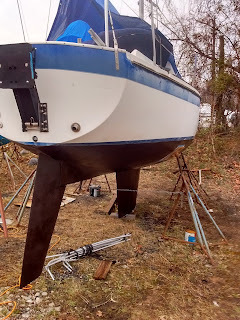 Waiting for clearer skies and warmer weather late next week to finish the hull paintwork. Then we can splash the thing. Oh, hey, only 20 days left on our Indiegogo campaign, and we're WAAAAAYYY short of what we had hoped to raise. If you'd like to lend us a hand and be part of this project, head on over here. Every little bit madly appreciated. Thanks.